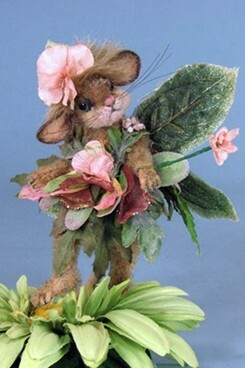 In a secret garden not so far away, fanciful creatures come to life thanks to the loving care and creativity of Mary Wimberley. Mary's Secret Garden takes it's name from one of Mary's favorite childhood books. 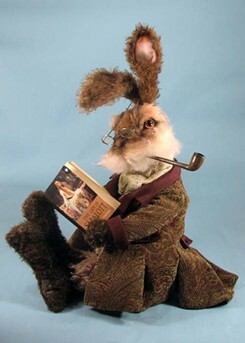 In the story, a character named Mary Lennox discovers a key to a secret garden. Mary Wimberley's creations wear a brass key in honor of the original Secret Garden. So slowly turn the key and let's take a peek inside. "I’ve been many things in my life but through it all, I was and am an	artist," Mary states happily. As a child, Mary sculpted dogs with modeling clay, painted on her easel, drew on her enormous blackboard, sketched portraits of her friends, played with felt, made ornaments out of dough, puppets out of papier-mache and of course, learned to sew from her mother. In the mid to late 1970's, Mary taught Kindergarten; enthusiastically telling stories to her class and using her hand-made puppets as part of her story telling. The bulletin boards in her classrooms oozed with creativity. 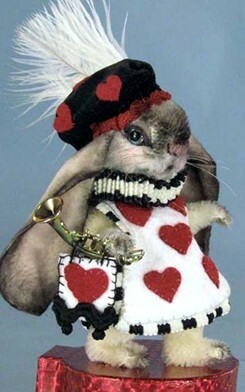 "Later when I became a puppeteer, I refined my skills as a	sculptor and costume designer," Mary said. Those puppets later added a visual element to her work as a professional story teller in the early 80's. 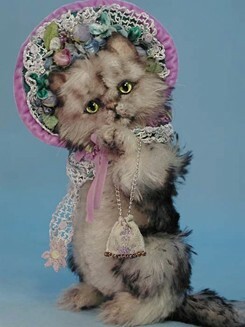 In 1983, Mary created figures, sets and props for store displays and walk-through storybook villages. "I learned much that would later become essential to me as I designed characters, costumes, buildings, layouts, props and sculpted	and painted the figures themselves." She also wrote stories to accompany the walk-through displays and this would help her characters develop and come to life by giving each one their owner personal history. 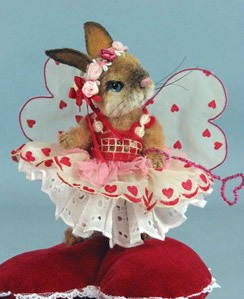 In 1993 she was able to merge her passion, skill and artistic experience into a career in the Teddy Bear world. "My skills served me well in this new venture but what made it perfect was my love of nature, especially little furry creatures. As a child, stuffed animals crowded my bed at night and during the day, I saved	my nickels to buy new critters," Mary recalled. "I did have a favorite	bear named Big Fuzzy but my “hug” was a colorful menagerie of	bunnies, foxes, deer, hedgehogs, etc." Little seems to have changed	over the years as far as her love of real and stuffed animals goes. "I	still talk to sparrows and kiss my stuffed animals on the nose." Maybe back then, she did vow to pursue this passion as an adult. 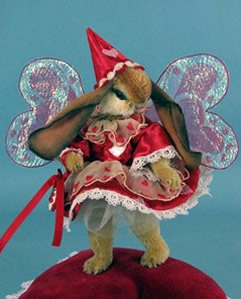 Mary's collectors are passionate about real animals but also appreciate the whimsical poses, the fanciful costumes and expressive faces of her animal menagerie. 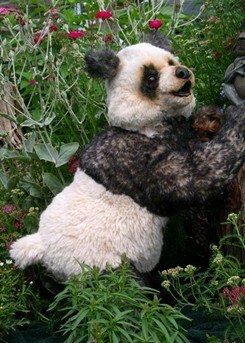 "I think that my customers know that Secret Garden animals have a special tale to share with them." 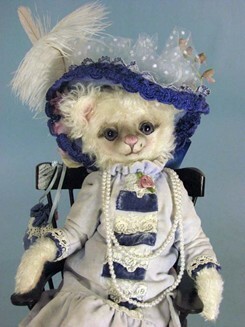 The reality and the expression of her animals comes from her choice of fabrics, her pattern design, hand painting of the fur, and deep needle sculpting and trimming of the face and feet. 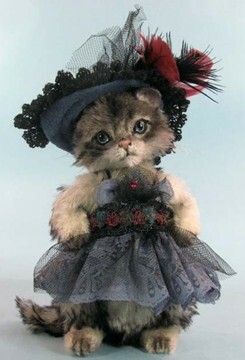 Details such as horsehair whiskers, painted toes, bright hand painted eyes set in eyelids which adds yet another dimension. 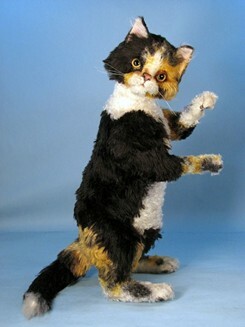 The wiring in the limbs and use of multiple joints allows the collector to see the full range of their animal’s personality as they learn to pose them. contrast with the fur and are exciting together. 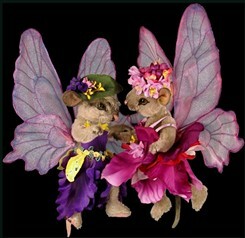 each costume is built layer by layer with jewelry, watches, chatelaines, purses, canes, adding the last finishing details. "The photography is important to me too. It helps me to see if anything is missing or needs adjustment. I get to know each character better, and as I view the photos, I begin to hear his/her story," Mary revealed. 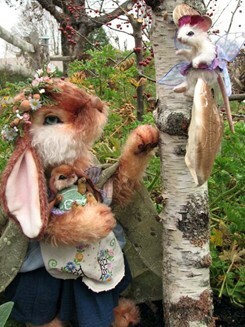 "My love of nature, sculpture, fabric, pattern making, costume and communing with people and animals continue to shape my career	path," she said adding, "Now, I’m integrating my passion for making characters, finding and making props, photography, gardening and	writing by creating children’s stories using photographs of my original	characters as the illustrations." 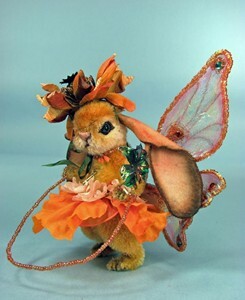 Mary wrote her first illustrated story for Teddy Bear Review in 2007 called, Bunchinella Hears a Bell, featuring a mother rabbit forced to believe in things she cannot see." Be on the lookout for more stories as more ideas and characters are brewing in Mary's creative mind and vivid imagination. Now, she is exploring embroidery in a big way. 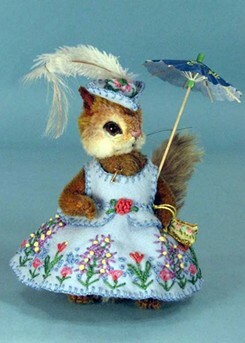 Azure Sky, the red squirrel with the blue dress, was created after she received	compliments on her fledgling embroidery on Anderson Foxmoore’s	riding jacket. 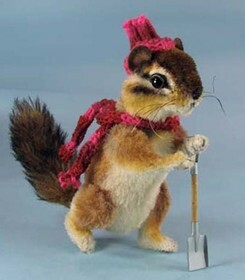 "Encouraged, I went even farther with the squirrel’s dress and now have a new element to add to costumes and a new	passion," she stated happily. She said, "I need help from my “peeps” when choosing which of my ideas to pursue." Often a comment, a request, a compliment or some encouragement from a customer or friend will direct her and spark her creativity. 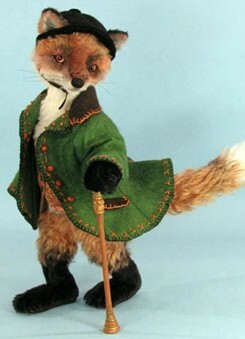 enthusiastic response from people (and won a first place URSA prize in 2006) that I have continued to make many unusual hand pieced felt costumes since." Collectors inspire and challenge her. 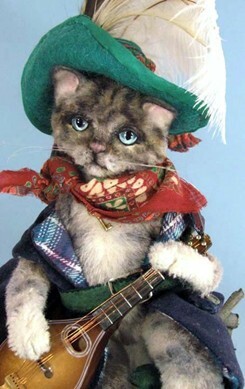 The animals of which she is	most proud are ones inspired by her collectors. "My dressed cats, my	movement cats, my chubby chipmunks, my fox, and many others	would not exist today if it were not for my collectors. That’s why I encourage my customers to order custom pieces so we can conspire	to create what neither of us would have dreamed of alone." "For me it all boils down to my love for people and my desire to share my love of life with them. One of the reasons I want to write books is to share with more people including children." The other reason, she feel sure is that there is more to say that she can fit into any one animal. The gates of Mary's Secret Garden are full of adventure and stories waiting to be told. And we know that collectors everywhere will gather 'round to hear the tales.